To the amusement of the pundits and the regret of the electorate, our modern political jargon has become even more brazenly two-faced and obfuscatory than ever. Where once we had Muckrakers, now we have Bed-Wetters. Where Blue Dogs once slept peaceably in the sun, Attack Dogs now roam the land. During election season—a near constant these days—the coded rhetoric of candidates and their spin doctors, and the deliberately meaningless but toxic semiotics of the wing nuts and backbenchers, reach near-Orwellian levels of self-satisfaction, vitriol, and deceit. The average NPR or talk radio listener, MSNBC or Fox News viewer, or blameless New York Times or Wall Street Journal reader is likely to be perplexed, nonplussed, and lulled into a state of apathetic resignation and civic somnolence by the rapid-fire incomprehensibility of political pronouncement and commentary—which is, frankly, putting us exactly where the pundits want us. 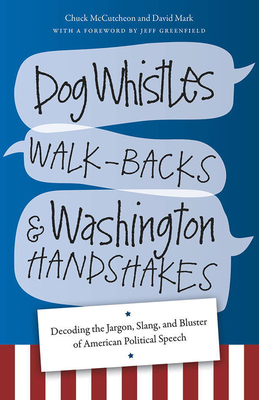 Dog Whistles, Walk-Backs, and Washington Handshakes is a tonic and a corrective. It is a reference and field guide to the language of politics by two veteran observers that not only defines terms and phrases but also explains their history and etymology, describes who uses them against whom, and why, and reveals the most telling, infamous, amusing, and shocking examples of their recent use. It is a handbook of lexicography for the Wonkette and This Town generation, a sleeker, more modern Safire’s Political Dictionary, and a concise, pointed, bipartisan guide to the lies, obfuscations, and helical constructions of modern American political language, as practiced by real-life versions of the characters on House of Cards. Chuck McCutcheon is a freelance writer and editor in Washington, DC. He has been coeditor of Congressional Quarterly's Politics in America and a reporter for the Newhouse News Service.